Liz Burgess traveled to Washington, D.C., on January 21 to voice her support for women’s rights and protest the election of President Trump. The Women’s March, attended by an estimated 500,000 people, gave Liz a voice, and more. “I didn’t realize until I got back how depressed I had been. 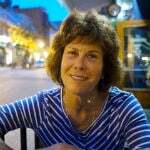 I came home exhausted, but I was smiling again, I had hope again,” Liz told Kendal at Oberlin residents and friends at a post-march forum held at Kendal. In all, about two dozen Kendal residents, staff, board and family members, attended the D.C. march. 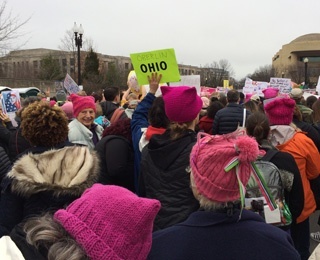 Many others from Kendal and Oberlin donated water, snacks and bus fare and knitted pink hats with cat-like ears for the marchers. “Sister” women’s marches were held in cities across the world, from Antarctica and Austin, Texas, to Paris, France, and Philadelphia. “The Women’s March on Washington began as an organically growing groundswell the day after the 2017 election when a grandmother in Hawaii proposed to forty of her friends to go march in Washington,” according to the Women’s March website. Liz, Kendal at Oberlin’s board chair, was captain of the Oberlin bus, which broke down in Pennsylvania three hours from D.C. Luckily, two buses from Dayton drove by, stopped and had empty seats for 41 passengers. Liz and a dozen others stayed with the ailing bus, and after a five-hour delay, arrived at the march. 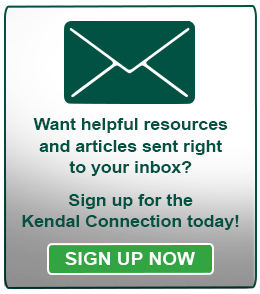 At the Kendal forum, marchers shared their stories. Rather than wait at the crowded Metro Station, resident Nancy Lombardi and others decided to walk three miles to the start of the march. The neighborhoods were festive, decorated with Martin Luther King Jr. signs and full of well-wishers, young and old. “A boy was holding a ‘Peace and Justice’ sign, and it was bigger than he was,” she said. Monica Fuquay, a native of Medellin, Colombia, was inspired by what she saw. “Everybody was in such a great mood, laughing and dancing and singing,” said Monica, a dining room server at Kendal. A marcher gave Monica a poster of a woman draped in an American flag that she will keep forever. At the march, Ann Francis, president of Kendal at Oberlin Residents Association, wore a “Grow Justice Apron” over her coat. “The police were actually cheering us. One said, ‘I’m so glad you are here,’” she said. “We didn’t walk very far because we were so busy talking to people with Oberlin connections – students, alumni, parents, prospective students, in-laws,” John said. Kendal resident Gretchen Roose, 95, was unable to attend the march, so her daughter, Deborah, improvised. 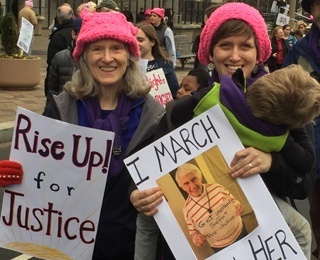 She made a poster of her mother holding a pro-choice sign, and brought the poster to D.C., where she marched with Gretchen’s granddaughter and great-grandson. Deborah spent Monday visiting electing officials, urging them to examine the records of Trump’s Cabinet confirmations before they vote. As for the return bus trip, all the Oberlin passengers found their way to the repaired bus parked at RFK Stadium. They arrived home Sunday morning at 4:30. The bus driver, who replaced the first driver because of required rest time between shifts, gave departing passengers a word of encouragement. “Ladies, you keep this up,” he said. D.C. marchers from Oberlin are planning a second event to share their stories. The community gathering will be held Friday, Feb. 3 at 7 p.m. at Peace Community Church.